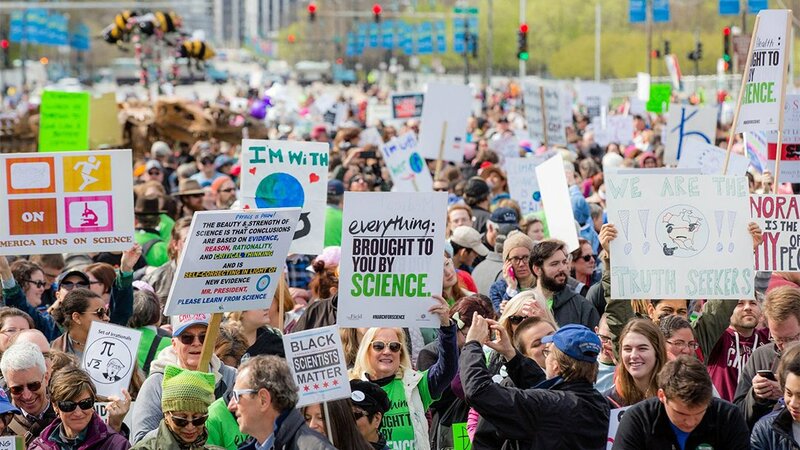 Instead of marching through downtown streets, this year’s event takes the form of a science fair and rally, said Noah Cruickshank of the Field Museum, the event’s primary organizer. Dubbed “Speak Up for Science,” the event is scheduled for 1-4 p.m. Saturday at the Field Museum’s Southeast Terrace. It is free and open to the public. Participants last year gathered at the Field Museum to meet others marching and stop by booths set up by science-based organizations from across the city. The “science fair” format served as inspiration for this year’s “march,” Cruickshank said. Science enthusiasts of all ages will have a chance to meet Field Museum scientists and learn how to make a difference in the fight against climate change, according to organizers. Participants will also be able to send postcards to the U.S. Environmental Protection Agency and National Science Foundation describing why science, particularly conservation and efforts to combat climate change, matters to them. The “Postcards for Humanity” campaign is sponsored by the popular Chicago-based party game Cards Against Humanity. Postcards filled out during the event will be displayed in the Field Museum’s Stanley Hall through Earth Day on April 22 before being mailed to EPA and NSF headquarters in Washington, D.C.
Cruickshank said he doesn’t know how the EPA and NSF will process the thousands of postcards expected to be sent following the event. “But we hope that the message gets through when there are so many of them coming,” he said. In addition to scientists from the Field, participants will be able to meet representatives from 16 scientific organizations, including the United Sciences of Chicago, Sierra Club, Nature Conservancy and International Dark Sky. Volunteers from the League of Women Voters will run a voter registration table. Admission to the Field Museum is free for Illinois residents on Saturday. For more information about “Speak Up for Science,” go to the event’s Facebook page. April 3: For the first time, Shedd Aquarium will host a full week of events leading up to Earth Day on April 22. April 25, 2017: According to organizers, an estimated 60,000 people attended the March for Science Chicago, making it the largest of those that took place Saturday in 400-plus cities worldwide. But some area institutions did not officially support the event. April 21, 2017: The rally, march and expo is projected to be among the largest of those taking place Saturday in 400-plus cities worldwide.